When it comes to business process outsourcing services, there are two countries in the world that rules the roost – India and the Philippines. In fact, in recent times competition between the two Asian countries has become so severe that at times it is quite difficult to pick a clear winner. 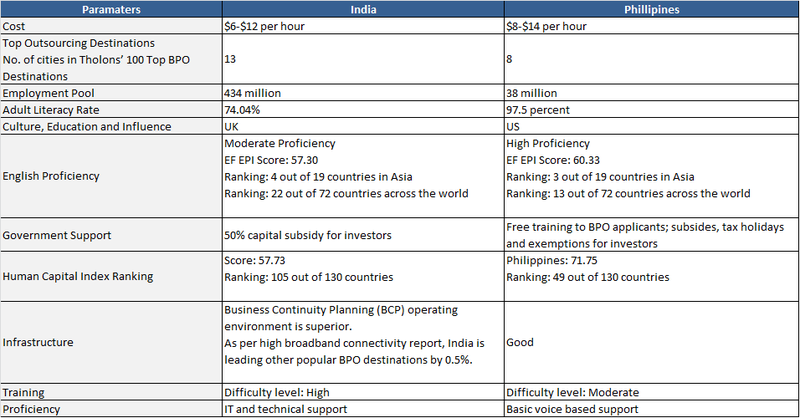 Both these nations complement each other with regards to time-zone, work force skills, and from BCP stand point. Hence it is better to look at this topic as, “Philippines and India,” rather than “Philippines versus India,” and opt to partner with a company that offers the best of both destinations such as ExpertCallers. We have delivery centers in both Philippines and India, and let the clients choose the delivery center based on their requirement. This unique trait sets us apart from rest in the industry. Contact us to know more about our inbound and outbound call center services.